As part of the application for the commercial redevelopment of the site a desk study (prepared by others) was submitted alongside the application. The desk study report proposed further works but did not specify the scope of the works. 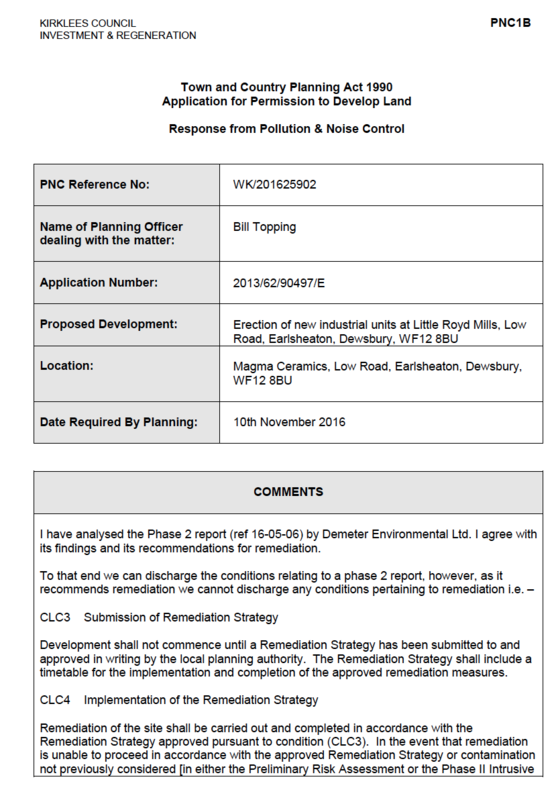 Demeter Environmental were commissioned to undertake the Phase II intrusive works required to discharge the planning condition attached to the decision notice. In order to determine the scope of the intrusive works the previous desk study report was reviewed alongside with historical O.S. maps, data in the public domain as well as information provided by the Environment Agency. 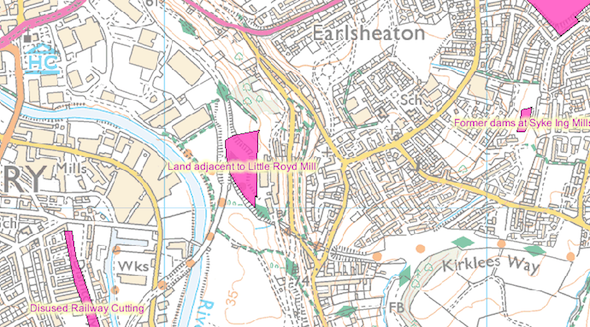 O.S maps indicated that the site was occupied by a wollen mill (Little Royd Mill) and associated reservoirs and infrastructure. Information provided by the Environment Agency indicated the site was landfilled between 1980 and 1982, the landfill was licensed to accept inert and commercial wastes. A site reconnaissance visit was undertaken to ascertain if any changes had occurred ont he site. 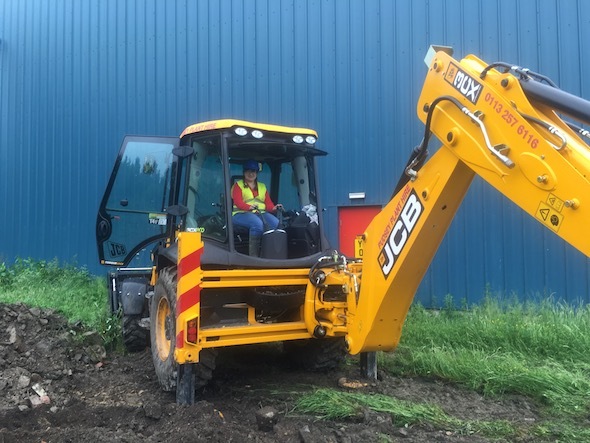 The scope of the intrusive works were submitted to the local authority prior to the commencement of the works in order to gain approval from the regulators. The investigation comprised of an oversite investigation (trial pits) to determine if the mill and landfill has impacted site soils as well to determine if made ground was present. The in-filled reservoirs and in-filled pond on the site were targeted. As the site was a potential source of ground gases the gas generation potential of the site soils were assessed using the methodology in the CL:AIRE Research Bulletin ‘A Pragmatic Approach to Ground Gas Risk Assessment’ as well as BS8485:2015 using Total Organic Content of the fine soils fractions. Ground gas monitoring using installation with response zones in the landfill material were also installed in order to obtain additional data. The investigation revealed the landfilled material comprised of a gravelly sand where the gravel comprised of brick, concrete and metal. The mudstone bedrock was recorded in a number of locations. 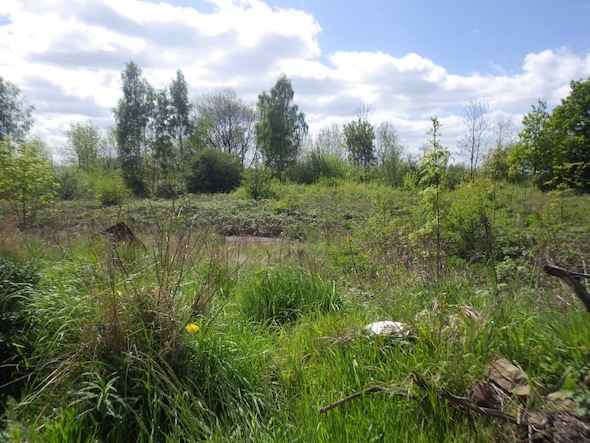 The assessment of the gassing potential of the landfilled material was undertaken, based ont he assessment the site would classify as Characteristic Situation 2. Ground gas monitoring confirmed that the site complied with Characteristic Situation 2 due to elevated levels of carbon dioxide. Gas protection measures were recommended to be incorporated into the building design. 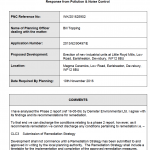 The risk ot the end users of the site was assessed and elevated levels of PAH’s and pesticides in one location posed a potential risk to human health. Site soils were also identified as potentially phytotoxic due to elevated levels of copper in the site soils. 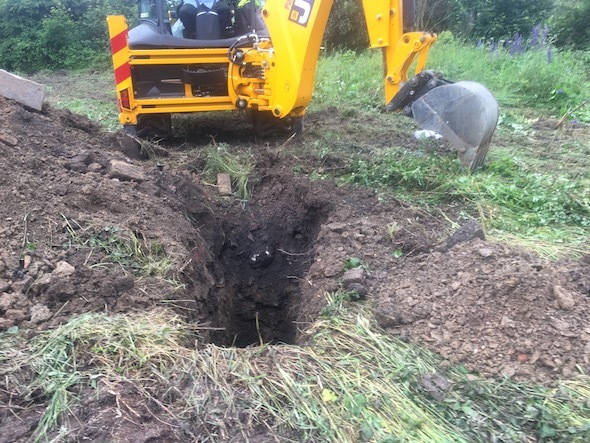 Risks to water mains were also assessed and due to the presence of hydrocarbons in the site soils, PE or PVC mains would not be suitable. The Phase II report was submitted with 2016/44/92974/E to discharge the condition, the report was accepted and the condition discharged.